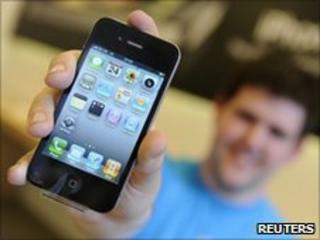 The launch of Apple's iPhone 4 also marks the end of unlimited smartphone data plans from major UK mobile phone companies. O2, which was Apple's exclusive UK partner for the iPhone, has introduced a monthly cap of up to 1GB (gigabyte) for data on new contracts. This mirrors a similar recent move by rival Vodafone, and Three has also today announced a 1GB monthly cap. Some observers expressed surprise at Three's decision to impose a limit. Ben Wood, a mobile phone analyst at CCS Insight, said: "We had expected that Three would seek to differentiate its offer from rivals by offering bigger data bundles. "It has obviously realised that this approach would see heavy data users signing up and clogging up its network." Orange has always imposed a 750MB monthly "fair usage" policy since it started to offer the iPhone in late 2009. Mike Wilson, mobiles manager for Moneysupermarket, said: "With the limit set at 750MB, there is very little difference between a cap and a fair usage policy". Some networks vary their data bundle between 500MB and 1GB per month, depending on the cost of the contract a user chooses. A 1GB cap amounts to approximately two to three hundred MP3 song downloads in a month. And a message on O2's website says that a user with a 500MB cap could send 1,000 e-mails with photos attached. But data consumption grows very quickly when users start to stream video on their phones. Mr Wood said: "It's very difficult for users to keep track of their data usage. "I pity the poor user who loves to watch videos on YouTube, then smashes through his monthly allowance in no time at all. "The onus is on the network operators to make sure they have processes in place to regularly update users who are approaching the top of their data bundle," he said. O2's website said: "If you're using lots of data and getting close to your network data limit, we'll let you know with a text message." A spokesman for O2 told BBC News that once a user had hit the data limit, their connection would be throttled; users would still be able to send and receive e-mails, but would have difficulty in viewing video. The firm said users would be able to top-up their limit, at a cost of £5 per extra 500MB. Mobile phone companies have also said that the vast majority of their customers are using well below the level of the data caps they impose. "In the UK O2 revealed that 3% of users on smartphone tariffs accounted for 36% of its smartphone data traffic," said Mr Wood. But he also argued that demand for data consumption is only likely to increase. "This is a near-term fix, and the bottom line is that network operators are going to have to invest a lot of money in new technology to ensure they can cope with demand from their customers."